The first building which is part of the exhibition area has a massive collection of Carlsberg beer bottles from around the world on the upstairs floor. It’s easy to miss this as you come back down the stairs to continue your tour, but make sure you don’t as it really does emphasise just how big the company has become. After the bottles, you see how lager was first brewed here and how the company grew over the years. The next building houses the stables area where you’ll find working horses still in residence. When we visited, they were getting ready to go out with one of the historic Tuborg carts. It was lovely to see the company continuing to keep the horses, if only for tourism and promotion opportunities. Here’s one of the best bits of your trip to Visit Carlsberg. It ends in the bar where your admission ticket will allow you two drinks! Considering the price of alcohol in Copenhagen, the admission price at the Visit Carlsberg is great value for money with 2 beers at the end of it. 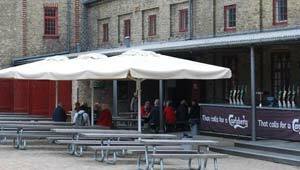 Adult admission to Visit Carlsberg is 70 DKK (2012 prices). The Visitors Centre is open Tuesday to Sunday from 10am to 5pm.